I've just seen a drain degreaser and deodoriser advertised for $5.99! Ouch! If you have sluggish or smelly drains, or to keep them from becoming sluggish and smelly you don't need to spend $6. Pour half a cup of bicarb soda down the drain, followed by 1 cup of white vinegar. Put the plug in and let it sit for 15 minutes. The bicarb soda and the vinegar will fizz and bubble away, cleaning up odours and slowly eating blockages. After the 15 minutes, fill the sink with boiling water. Pull the plug and let it the boiling water flush the drain clean. 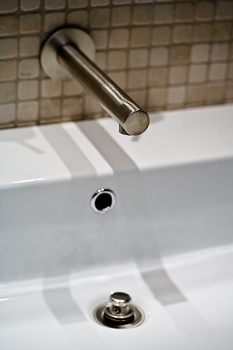 Do this on a monthly basis and your drains will always be clear and fresh for around 20 cents, a saving of $5.79! Hi - love white vinegar...... this remedy is also a great way for getting grease and stubborn marks off concrete......sprinkle with bicarb then spray with white vinegar and when it finishes fizzing either hoze off or use a watering can or bucket to wash it off. We also use white vinegar only for weed control on a large paved driveway and patio area. Just spray stright white vinegar on them and watch them wither away.... pull them out when withered, sweep away or just leave them be (as we do ). Fantastic - works really well and the vinegar on weeds is wonderful - can vouch for that one.